"I tried all 6 flavors that came in the sample box and they all taste really good. I liked double chocolate the most. I wish they included the orange flavor in the box." "Obsessed with these bars. I'm constantly torn between chocolate and mint. Super excited about the build your own box option for next time." "I love your bars! Taste like I'm eating a candy bar, not a protein bar. Your bars have really helped me on my journey to get healthy and loose a few pounds. Thank you!" "love the taste and texture, they are delicious "
"By far the best protein bar ever made! " "Must be frozen for me because of the gel like texture and then they are awesome!! Totally satisfy my hunger like no other protein bar and they taste good too! " "Love these bars! They’re everything I’ve been looking for in a protein bar...high protein, great flavors low calories and very satisfying!" "I am in love with the Built Bars! The coconut one and the strawberry one are my favorites, with the double chocolate running a close second. I tried the bars as is, and frozen and have decided that I prefer the bars room temperature. They are indulgent and satisfying and completely take away my desire for candy! The consistency is chewy, which I love, and the coconut ones remind of a coconut patty from Florida. I may never go back to eating regular candy ever again! The portion is plenty and at 110 calories, I am in love with these bars!!!" "Loved the variety in this box! A veritable smorgasbord of goodness. " "I love these bars. I am on a restricted sodium diet and the 3 mg of sodium is fantastic. They are delicious as well! The chewiness means you have to work harder to eat them which means you go slower and really enjoy the bar and feel satisfied. I have my favorites but enjoy all of them!" Amazing! Best bars we have ever had! "These are great. We especially like to keep them in the fridge, they taste even better if you can believe it!" "I have loved every flavor I’ve tried! They are perfect for me. I have a sweet tooth so this helps with my sweet cravings. It’s a great snack." "i REALLY LIKE THEM. tHEY AREE SO EASY TO TAKE WITH YOU WHEN YOU ARE ON THE GO. I WILL DEFINITELY ORDER MORE!" "Built Bars are delicious. Love them cold, so I keep them in the fridge. Just wish shipping was more reliable. One order they arrive in 3 days, next time it takes 10 + days. I travel quite a bit and it makes it hard to have them on hand and time arrival so I am home to get them. Especially with summer coming up. They can’t sit behind door all day or overnight when it gets hot. " "Fantastic! I have ordered three times and will continue to order. Tasty, filling, not sugary. I can eat a Built Bar at the end of my work day and feel satisfied for the rest of the evening." "The chocolate on the outside is REAL CHOCOLATE! They are delicious! My favorites are salted caramel, vanilla, chocolate, mint, orange, and coconut. I eat one every morning for breakfast. When I eat the coconut one I feel like I’m eating a mounds bar!! One of the best perks is they have free shipping, and they are very timely when shipped! " "I love the Built bars. I have one every morning for breakfast with a banana and a light muscle milk. It satisfies me way into the afternoon. They are so delicious. I have at times had them for a late snack as well! Every flavor is yummy! " "I love built bars! They are such a great snack and add of protein, but with the lure of a candy bar!" "My new replacement for Mounds bars...definitely my favorite built bar." "The bars were delicious! I ordered more !" "These by far are my favorite!!! I'm sooooo glad I discovered them!! Thank you Builtbar!!!!" "We love every flavor. " "These protein bars are the best tasting I've ever had and they fulfill my need for sweets and for chewing. They've assisted me and being able to lose 20 lb." "It's hard to decide on a favorite flavor! Packed with protein, low in calories, sweet and decadent. What's not to love? After eating a delicious Built Bar, you'll never want to eat the empty calories of a candy bar again." 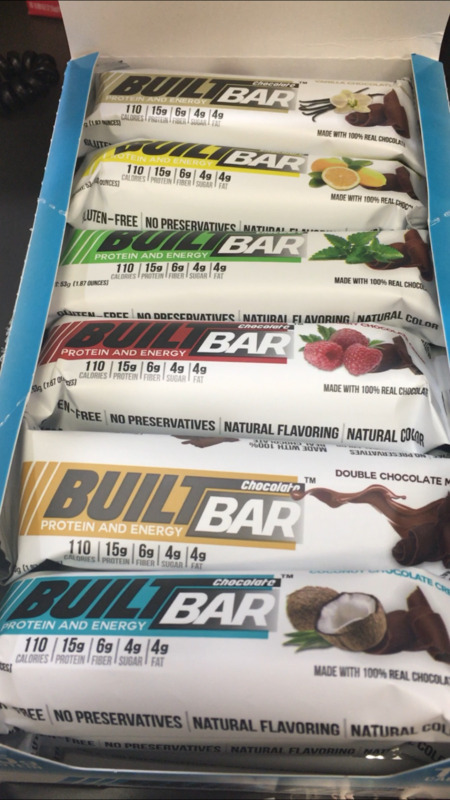 "I thought built bars tasted amazing! They are very expensive, I wish you could offer a discount. I can't post the picture to get 20% do you have a code you could give me to get the 20%off I would love to buy some more! It would very much be appreciated! Thank you!" "The chocolate is amazing!! So much like a candy bar "
"The coconut Built bar is my absolute favorite. I keep them in my purse, at work etc. I love that the calories are lower than other protein bars. I'm a fan!" "I love the Built bars. Strawberry and coconut are my favorite." "My husband and I really enjoy the built bars! We have included them in our healthy eating regimen and they are fantastic! They are so enjoyable, and really satisfy the “sweet need”! "